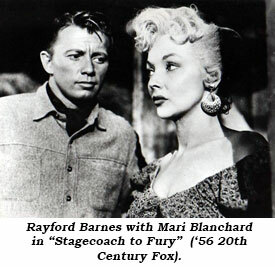 The man with the mean looking smirk, Rayford Barnes was one of the busiest badmen on episodic TV from ‘54-‘69, besides working in some classic westerns of the period—“Hondo”, “Wichita”, “Shenandoah” and “The Wild Bunch”. Born October 23, 1920, near Whitesboro, TX, the WWII Navy and Merchant Marine vet began his career in New York training with Stella Adler at the Neighborhood Playhouse, later moving to San Francisco to open his own theatre. Rayford actually came from a showbiz “family”. He was a nephew of comic actress Binnie Barnes who married producer Mike Frankovitch in 1940. Producer Peter Frankovitch and screenwriter Mike Frankovitch Jr. are his cousins. 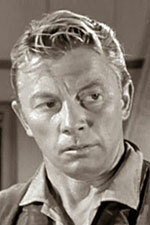 His first film was a Western, “Stranger Wore a Gun” in 1953 with Randolph Scott. 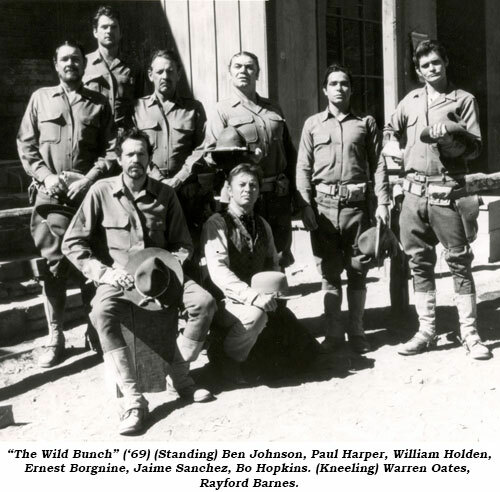 John Wayne’s “Hondo” was the same year and Rafe was on his way. 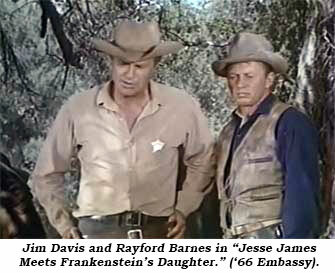 Barnes was still working up until his death, having just completed jobs on “ER” and “Walker Texas Ranger”. He married wife Debra in 1973. He may possibly have been married before. He died November 11, 2000, at St. John’s Health Center in Santa Monica.